For all the promise of graphene as a material for next-generation electronics and quantum computing, scientists still don't know enough about this high-performance conductor to effectively control an electric current. Graphene, a one-atom-thick layer of carbon, conducts electricity so efficiently that the electrons are difficult to control. 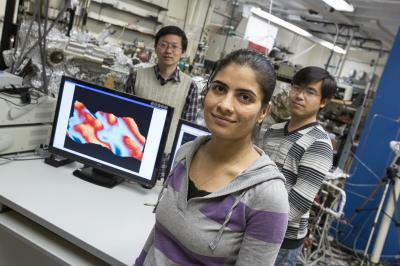 And control will be necessary before this wonder material can be used to make nanoscale transistors or other devices. The researchers demonstrated that when electrons are rerouted at the interface of the graphene and its semiconducting substrate, they encounter what's known as a Schottky barrier. If it's deep enough, electrons don't pass, unless rectified by applying an electric field -- a promising mechanism for turning a graphene-based device on and off. The research group, led by Lian Li and Michael Weinert, UWM professors of physics, and Li's graduate student Shivani Rajput, conducted their experiment with the semiconductor silicon carbide. The results were published in the Nov. 21 issue of Nature Communications.